Flood models and biblical realism Journal of Creation 24 (3): 46–53 December 2010. Sarfati works as a researcher in Creation Ministries International (CMI). Sometimes we hear that CMI does not represent Young Earth Creationism with its biblical 6000 years chronology. But such claims are false. CMI markets a collection of articles edited by J.F. Ashton In Six Days (1999). Here 50 doctoral level writers exlain independently each from his or her point of view why the world is 6000 years old (young). John F Ashton, In Six Days. Creation Ministries Int, 1999. 360 p.
Fifty Ph.D. scientists each wrote a chapter, without collaboration, telling why they hold to literal creation. Features fields as wide-ranging as geology, cosmology, zoology, botany, geophysics, biochemistry and more. Will have a powerful effect on the unbeliever who reads it, and be immensely encouraging to believers. Even if not every CMI associated researcher represents YEC world view Sarfati himself definitely does as shown by his article in Ashton's publication. We should believe in a recent creation in six consecutive normal days because the only Eyewitness tells us this is what He did, and He has shown that He should be trusted. While this requires faith, it is a faith amply supported by science, as I can confirm from my own specialist field. Model-building should be an example of the ministerial use of science. In contrast, the magisterial use of science, practised by all compromisers on Genesis, overrules the clear teaching of the Bible to come up with a meaning inconsistent with sound hermeneutics. Instead of the Reformation principle of Sola Scriptura (Scripture alone), this is Scriptura sub scientia (Scripture below science). With these principles, some popular ideas can be examined. ... all compromisers of Genesis = any interpreation that does not represent American fundamentalism à la Chicago 1978 statement about Biblical inerrancy. ... Scriptura sub scientia = all research that does not accept the total and absolute authority of the Bible as the purest representative of truth both in earthly and in heavenly matters. Many creationist works from a few decades ago portrayed the antediluvian world as a paradise, which was horribly spoiled at the Flood. But this is not taught in Scripture. ... But even if she were much younger, more recent research points to aged fathers as a major source of genetic disorders. This should not be surprising since men keep producing sperm throughout their lives, and older men have more mutations. So it is not surprising that Shem, while very fit by today’s standards, would have been considerably less fit than his parents, and carried extra heritable mutations. Truly representative example how Sarfati reads the Bible as a man of our modern scientific era (hermeneutics). Furthermore, the Bible gives no indication that the ‘laws of nature’ (really God’s regular ways of upholding His creation) were any different before the Flood from what they are now. Yet they would have to be if there were no evaporation, precipitation and differential refraction before the Flood. Some times we have noted how creationists explain things by saying that God "stopped natural laws for a moment" or that pre-Flood world worked differently from post-Flood world. Sarfati rejects such thinking. One idea for the pre-Flood world, derived partly from the fallacious pre-Flood paradise assumption, is that oxygen concentration or atmospheric pressure was higher than today. This would supposedly have beneficial effects duplicated in today’s hyperbaric chambers. These increase the oxygen partial pressure as per Dalton’s Law. This doesn’t disprove a higher oxygen concentration and air pressure, but it shows that they were not needed scientifically. They are definitely not needed on biblical grounds. Strange pseudo-scientific mumbling that has nothing to do with the subject of the article. As a chemist Jonathan Sarfati may find it very difficult to realize that the writers of the Bible knew nothing of an invisible gas called by modern science air. The Bible does not have a Hebrew word for air. Instead, it speaks about the thing we can observe and feel, wind "ruach" and of blowing air. This theory Sarfati rejects on Biblical grounds as such a tsunami would only be a local phenomenon. Bible says that water covered highest mountins so it must have covered the entire world. The canopy theory, as a model for the beginning of the Flood, aligns strongly with this ‘antediluvian paradise’ idea. This asserts that the ‘waters above’ referred to a canopy of water vapour, which condensed and collapsed to provide the rain for the Flood (figure 1). A few decades ago, this was very popular—for good reason, since it seemed to explain many things about rain, rainbows and longevity. Now it is rejected by most informed creationists. Sarfati explains on the basis of Bible and modern science why this popular explanation to the Biblical Flood is not valid. However, the real problem was that some creationists gave the impression that it was a direct teaching of Scripture; CMI cautioned against such dogmatism back in 1989 when the model was still very popular among many creationist writers. After all, for most of church history, no one had seen a canopy in the actual text of Scripture, yet God specifically wrote Scripture to teach, i.e. to be understandable (2 Timothy 3:15–17). Furthermore, it seems to contradict Scripture, since Psalm 148:4 says: “Praise him, you highest heavens, and you waters above the heavens!” Clearly these waters could not have been a canopy that collapsed during the Flood, since they were still present during the time of the Psalmist over a thousand years later. Many of the arguments for the canopy were faulty on scientific grounds. For example, one argument is that the canopy would protect us from damaging radiation, and explain the extremely long lifespans. But water vapour is not a great shield for UV—you can be sunburned on a cloudy day and while swimming. When it comes to cosmic radiation, there is no evidence that this is involved in longevity, and as stated above, the cause of decreasing lifespans was genetic rather than environmental. What water absorbs very well is infrared, as any vibrational spectroscopist knows. It is actually a far more important ‘greenhouse gas’ than CO2, accounting for about 66% of the atmospheric ‘greenhouse effect’ on Earth, or maybe even as much as 95%. This leads to the major scientific problem with the canopy theory—a water vapour canopy thick enough to provide more than about a metre’s worth of floodwater would cook the earth. Sarfati is critical on the theories presented by his own colleagues and argues why "waters over firmament" theory does not stand criticism. This is probably the most popular model among informed creationists today. This accepts much of the evidence adduced to support uniformitarian plate tectonics, but solves a number of problems. The CPT model begins with a pre-Flood super-continent (possibly indicated by Genesis 1:9). While uniformitarian models assume that the ocean plates have always had the temperature profile they display today, the CPT model starts with some additional cold rock in regions just offshore surrounding the supercontinent. Since this rock was colder, it was denser than the mantle below. At the start of the Flood year, this began to sink. ... But CPT is not a direct teaching of Scripture, so it is legitimate for creationists to question or reject it as a model, and a number of knowledgeable creationist geologists do. Opponents argue that it concedes too much to uniformitarianism, and that it doesn’t explain the whole of the Flood, but only the last half. --- uniformitarianism is among the geological concepts most hated by the creationists. Father of Geology, Sir Charles Lyell (1797-1875), presented the fundamental concept in his major Principles of Geology (1830-1833). Geological phenomena, such as the growth of river delta or the building up of hills on the slopes of a volcano happens at fairly uniform rate throughout history. This is a foundation stone of modern Geology and revolutionized scientific dating of Earth's surface in the 19th century. It also replaced the traditional Biblical chronology calculated from the genealogies. It is not helpful that Charles Darwin was a close friend of Lyell and ardent student of Geology; it was the new understanding of the formation of soil deposits through time that suggested to Darwin different stages in the history of organic life on Earth. Plate tectonics are a significant subject in modern research. It is really nice that Bible is also mentioned in this context - or is it? Furthermore, water and rocks were hurled at speeds exceeding escape velocity, so this explains the origin of comets, asteroids and meteorites (figure 3). Sarfati does not directly reject the theory proposed by engineer Dr Walter Brown (b.1937) but, instead, politely asks him to write more about the theme in CMI context. Sarfati replies to criticism that the Great Flood of Bible has somehow just vanished leaving no trace of it for us to study. After rejecting such a godless claim Sarfati now gives a beating to Lyell, Darwin and all other uniformists. 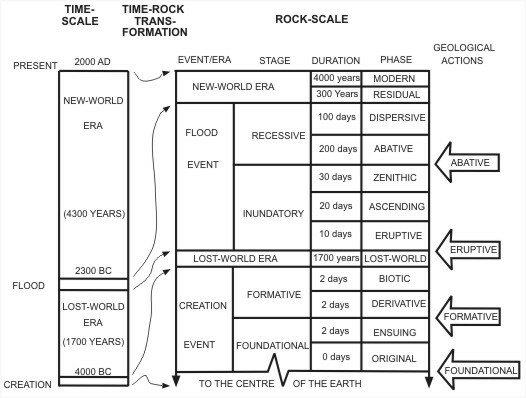 The Biblical Geologic Model is a geologic classification scheme based on the biblical record of Earth history. The model is useful for classifying geologic data, understanding geologic processes and guiding geologic research. It is a powerful tool for communicating biblical geologic concepts. Pay attention how Walker's model is offered as a comprehensive alternative to the sequential model of geological ages offered by modern Geology. Of course, anyone is permitted to publish alternative histories of Earth's crust and even to argue for the model using the Great Flood. People whose work it is to study the geological formations of Earth and their history evaluate these theories and take some into attention in their own work rejecting others. Personally I do not know a single introduction to Geology that would even mention Tas Walker's Biblical Geological model as a serious alternative. Jonathan Sarfati has worked hard analyzing creationist models of Great Flood. The article also gives a nice overview of his own methodology and Biblical hermeneutics. 1. The article demonstrates characteristic Creation Ministries Inc. circular reasoning creating the illusion of research that is done together by a team. The writers refer to each others within the closed circuit as if in legitimate critical scientific discussion of ideas. There is no real discussion with the views offered by modern scientific Geology. Central ideas are borrowed from there but handled completely free of any scientific research and method. There is no field research, geologist's hammers are not in action, nobody is diving to the bottom of the sea to study continental plates, no chemistry of rocks is discussed and the rock cycle is non-existent. This is arm-chair pseudo-geology full of mudslinging on real geologists pushing the boundaries of human knowledge of out planet. Instead of being thankful for the men and women who during the past 200 years have gathered and interpreted fundamentally important truthful facts about Earth and discovered more and more wonders in God's creation! 2. Sarfat's article is a good mile stone in the reality of New Earth Creationism today. It is honest and serious attempt to fit everything into the 4000 years genealogy from Adam to Jesus. Jonathan undoubtedly is among the leading gurus who works actively in CMI projects and is thus a representative case. Unfortunately, CMI is talking about its own reality of creation that in many ways resembles the reality of Jehovah Witnesses with their New World theories, Biblical references and "scientific quotes". The building has a certain internal logic in which different elements support each other - because they have been constructed purposely to support each other and the assumed truth of the Bible. Hello, Jonathan, where in your world is Gilgamesh Epos Table XI and the excavations of Abram's home town Ur? For the mountains shall depart, and the hills be removed; but my kindness shall not depart from thee, neither shall the covenant of my peace be removed, saith the Lord that hath mercy on thee..